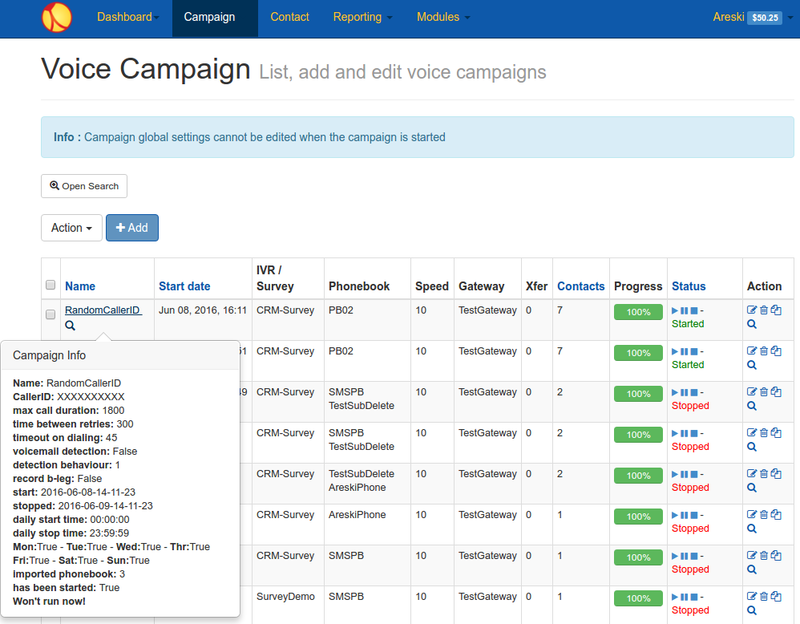 Newfies-Dialer, our voice broadcasting system used for marketing, press-1 campaigns, live transfer leads generation, outbound call centre and polling, undergoes continuous improvement, so we have now released version 3.6. We have taken a lot of time and care in optimising Newfies-Dialer with meticulous analysis of our database queries and call dispatching. This has paid dividends in that we have increased the number of calls that can be made for any given hardware. In our test environment, we have seen upwards of 2000 concurrent calls on a single server. From the perspective of an outbound call center, this means more live transfer leads at no extra cost in hardware, rackspace and electricity. As part of the optimisation process, we also built a Newfies-Dialer cluster on 4 servers, we were able to run calls in excess of 8000 calls per minute, which relates to 500K calls in an hour. There is still room for further optimisation, and we are working on that for large outbound call centers at the moment. We recently introduced billing to Newfies-Dialer making it suitable for telecoms companies and outbound call centers who want to provide voice broadcasting services and live lead generation to their customers. For larger systems, this includes integration with Braintree, a credit card gateway developed by Paypal for customer self service. For those already in the telecoms, voice broadcasting and outbound call center businesses, we have also provided a range of reseller options including branded or white-label distributor packages and a simple commission-only affiliate program. See https://www.newfies-dialer.org/reseller/ for more details. In addition to our live demo system, we recently introduced a new product to our Newfies-Dialer line-up, a small 10 channel system, including the server, with all the functionality of our larger systems, to allow customers to test out Newfies-Dialer on their own VoIP provider for only €80 Euro per month before investing in a large scale production system. We aim to get you started in one working day or less. Newfies-Dialer appeals particularly to outbound call centers and other companies doing large scale voice broadcasting, as you use your own VoIP carriers, negotiating the best possible rates with them, making Newfies-Dialer better value for money than many other voice broadcasting companies and who insist on you using their expensive termination.